Note: This is the bound book only and does not include access to the Enhanced Pearson eText. To order the Enhanced Pearson eText packaged with a bound book, use ISBN 0134539575. An established author helps educators implement the best evidence-based practices for teaching students with Autism Spectrum Disorders. 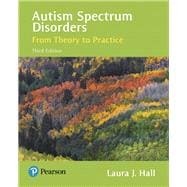 With a solid emphasis on research, Autism Spectrum Disorders: From Theory to Practice offers a practical approach to teaching students with Autism Spectrum Disorders (ASD) by providing a step-by-step guide for assessment and progress monitoring, and outlining a variety of evidence-based practices organized by major theoretical perspective. Hall devotes a complete chapter to cultural and linguistic diversity and addresses ASD across the lifespan, including preschool, school-age, and transition stages. Real-life In Their Words accounts give readers a first-hand look of what it is like to live with ASD. Updated with the latest research and strategies, the Third Edition includes a new chapter on systems of support for individuals with ASD and their families, new Sensory Considerations call-outs, and an enhanced focus on implementation science. The Enhanced Pearson eText features embedded videos. Laura J. Hall began her work as an educator working for the Princeton Child Development Institute shortly after graduation. The excellent training and coaching in the implementation of applied behavior analysis with learners with autism that she received inspired her to pursue further education. Her current research focus is on identifying strategies to improve the educator-learner interaction to increase effective implementation of evidence-based practices by educators working in schools. She is a site Co-Principal Investigator on a multi-site federally funded RCT study of a comprehensive educational program for high school students with ASD. She is a co-author of book chapters in several handbooks with a focus on evidence-based practices and ASD, including the recent Handbook of Autism, Pervasive Developmental Disorders: Assessment, Intervention and Policy, 4th Edition. As Department Chair, for Special Education at San Diego State University, she works in collaboration with colleagues in the college, colleagues in the community, including parents of students with ASD, and, most importantly, new colleagues or graduates of the MA. Degree program with a specialization in autism that she worked to establish at SDSU. Follow up studies reveal that the graduates of this program remain in the field and sustain their use of evidence-based practices. This Masters Program is currently supported by federal grants from the Office of Special Education Programs. She is also the department liaison with the Behavior Analysis Certification Board.